Win A Year's Supply Of Entenmann's Donuts & Milk! You are here: Home / Sponsored / Win A Year’s Supply Of Entenmann’s Donuts & Milk! Win A Year’s Supply Of Entenmann’s Donuts & Milk! 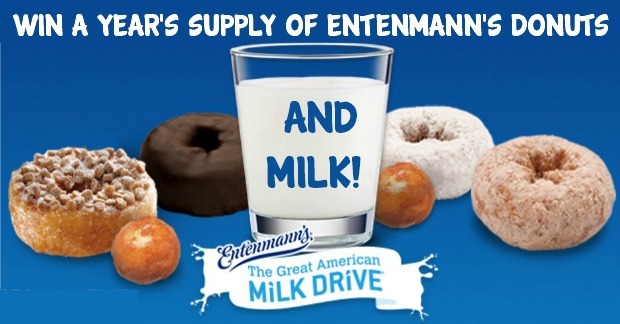 Entenmann’s® is proud to join The Great American Milk Drive in the “Entenmann’s® Donuts & Milk: Perfect Together Sweepstakes” helping deliver milk to those who need it the most. For every entry received during the “Entenmann’s® Donuts & Milk: Perfect Together Sweepstakes”, one 8 oz. glass of nutrient-rich milk will be donated to The Great American Milk Drive, up to 100,000 servings. They are also offering you a chance to win a variety of prizes during the Facebook sweepstakes, which continues through October 31st. As part of the Facebook sweepstakes, 25 first prize winners will win a one year’s supply of milk and Entenmann’s® donuts! Also, 100 second prize winners will win four boxes of Entenmann’s® donuts!